In Adxstudio Portal you can associated multiple external identities to a single contact record in CRM. For whatever reason let say contact Bob McCloud has two ADFS accounts with your organisation, contoso\bob1 and contoso\bob2. You can configure it so that regardless of which account is used to login with, the user context is resolved to Bob McCloud. Contact records in CRM has a grid of External Identities, and this is where the magic happens. Just add a record to this grid for each external identity that should be mapped to the given contact. 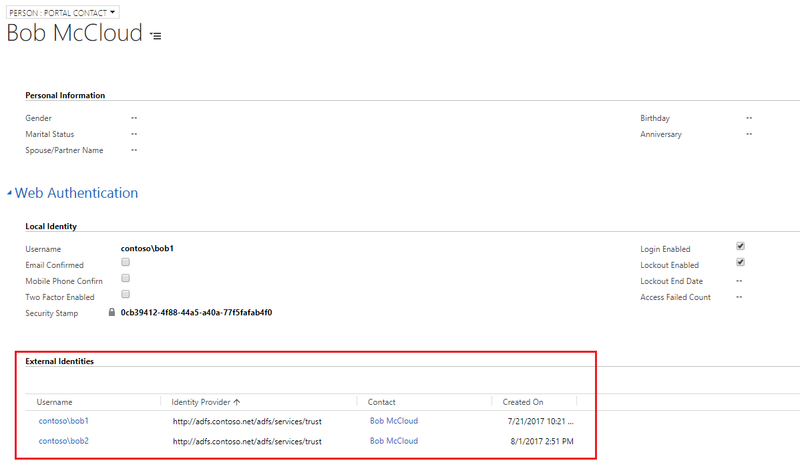 As we are using ADFS, we set the Identity Provider field to be the same as the value for the Authentication/WsFederation/ADFS/AuthenticationType Site Setting in CRM. The user context will now be resolved to be Bob McCloud when one of these identities are used to login.